RALEIGH, N.C. – No. 4 NC State (27-2, 10-2 ACC) scored four runs in the bottom of the seventh inning and held on to an 8-7 victory to clinch the series over Virginia (16-12, 6-6 ACC) on Sunday (March 31) at Doak Field at Dail Park. After Virginia scored four runs in the top half of the seventh to take a 7-4 lead, NC State stormed back with a four-run rally of its own to make the score, 8-7 The Cavaliers put the tying run on third base in the top of the ninth but NC State reliever Cameron Cotter retired the final two batters of the game. The Cavaliers had the lead on three different occasions but each time the Wolfpack responded in the bottom half of the inning to tie or take the lead. NC State improved to 11-1 in one-run games with its only loss coming to Virginia on Friday night (March 29). Sophomore Tanner Morris (Crozet, Va.) reached base four times and went 3-for-4 with a run and an RBI. In the fifth inning, he cracked his fourth home run of the year, a solo shot to give Virginia its first lead of the contest. He drew a lead-off walk in the top of the ninth and was left stranded 90 feet from home after advancing to second on a sacrifice bunt then over to third on a wild pitch. Virginia trailed 4-3 after six innings and nearly set themselves up for another late game comeback in its half of seventh inning. The Cavaliers sent nine batters to the plate, racking up six hits in the frame to go in front, 7-4. Freshman Nic Kent (Charlottesville, Va.) gave the Cavaliers its final lead with a ground-rule double down the right field line that scored Logan Michaels (DeForest, Wis.) and Cayman Richardson (Mechanicsville, Va.). A batter later, Cameron Simmons (Royersford, Pa.) delivered a two-out single that plated two runs and gave Virginia its largest lead of the afternoon. One of two Cavalier multi-hit performers, Simmons finished the day 2-for-5 with two RBI. 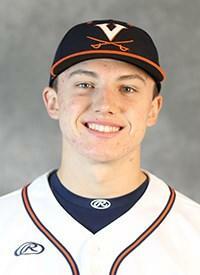 Freshman Zack Gelof (Rehoboth Beach, Del.) went 2-for-4 with a run scored and an RBI. He's now hit safely in 17-straight games and reached base in every game this season. Gelof is now tied with Ryan Zimmerman (2004) for the program's sixth longest hit streak since 2000. Virginia will return home to host in-state foe Old Dominion at Disharoon Park on Tuesday (April 2) before traveling to Notre Dame for a three-game road ACC series next weekend (April 5-7). First pitch on Tuesday against the Monarchs is scheduled for 5 p.m.
• Morris went 7-for-11 (.636) with three runs scored, three walks, a home run and an RBI in the series. • Devin Ortiz (Irvington, N.J.) faced three batters in the seventh and recorded the final two outs of the frame. He's not allowed a run in 4.1 innings pitched. • NC State improved to 26-19 against the Cavaliers since 2004.